Here we mainly focus on the adiabatic process in a system of an ideal gas. If you have read the article thermodynamic processes, you know that in an adiabatic process no heat can enter or leave the system. Natural processes undergoing rapid expansion or compression behave like adiabatic processes as there is no appreciable heat flow into or out of the system. In rapid expansion or compression of a system there is not enough time to exchange heat with the surroundings. In rapid expansion of a natural process the system does work spending its internal energy and cools down. In rapid compression work is done on the system which increases the internal energy and the system warms up. Natural processes are found to be approximately in agreement with the ideal processes. Figure 1 The $p-V$ curves for a system of ideal gas; the adiabat is steeper than isotherms. We already know that the internal energy of an adiabatic process of an ideal gas depends only on the temperature of the system. Increase in temperature means the increase in internal energy and decrease in temperature means the decrease in internal energy. In Figure 1 you can see $p-V$ graph in which the adiabatic curve called adiabat between states $a$ and $b$ is steeper than isotherms. 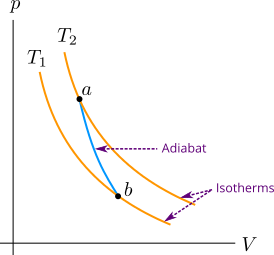 In adiabatic expansion the temperature of the system decreases and in adiabatic compression the temperature increases, and therefore the adiabat is steeper than the isotherms. Adiabatic expansion takes place from state $a$ to state $b$ and state $b$ is on the isotherm at lower temperature $T_1$ (temperature decreases).